One of my New Year’s Resolutions was to stop blogging about poop. But this blog is about Piper and poop happens to be one of her favorite topics. It’s February, so it’s time to break all resolutions anyway. Here goes. We see many interesting things on our walk home from school every day. Last week Piper and Dad watched local firefighters practice ice rescues in the pond at our park. They cut a hole in the ice, put out some orange cones, crawled on their bellies, and pretended to rescue a dummy from the icy depths. Our walk home always includes geese. 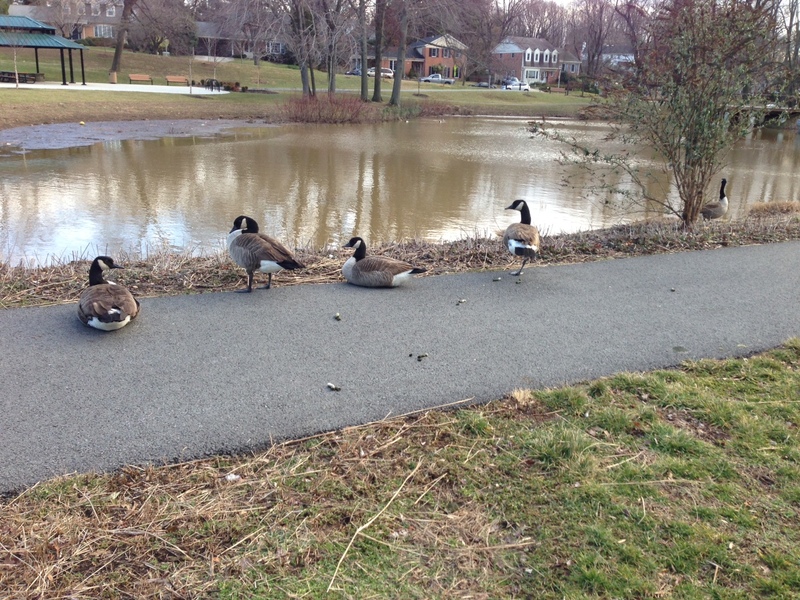 They waddle about on the path honking and pooping. I’m not sure geese do anything else but waddle, honk, and poop. They poop a lot. Piper thinks they should learn to control themselves a little. Piper pretended to waddle and poop behind the geese until she came to a splat. Then she leapt over and resumed waddling and imitation pooping. Pushing with the limits with that resolution there ehh. If you were male, you would never have to make that resolution. We got it good – ehh.